This good looking playhouse can deliver double the fun, and that’s because it has two distinct levels inside the building. Whilst its mid sized base area won’t take up too much room in your garden, the apex roof is higher than we’re used to seeing to accommodate the interior loft area. It’s accessible via an internal ladder, but don’t worry because it’s safe and the playhouse as a whole meets EN71 safety standards. Once inside the playhouse, the children will be dry and warm thanks to the very good weather defences provided as standard. The apex roof itself helps with this, as they cause rain to bounce or slide away, and we were pleased to find tongue and groove cladding used for the walls, as this means that there is no way for rain or moisture to get inside. That’s also a useful weapon in the fight against rot, although regular preservative treatment will also have to be applied. There are three styrene glazed windows on the two levels, and it was good to see that two of them are opening as well which will come in very useful when the little ones have been running around on a hot summer day. 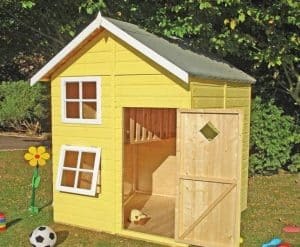 The base area of this classically styled playhouse is slightly larger than on many that we review, although it does still fit into the mid sized category. The overall width is 1.60m and the overall depth is 1.67m. Where it differs significantly is the vertical space available under the felt covered apex roof. The ridge height is 2.35m and the eaves height is 1.72m. This extra height is there to accommodate the integrated loft area. 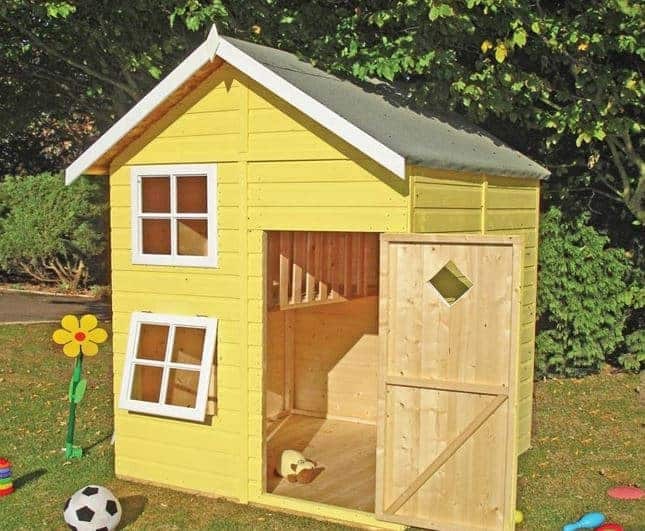 The lower story of this playhouse has more than enough room to store a good supply of toys, games, and books and it should easily be able to accommodate two children over the age of three. It also has a safe and sturdy ladder that leads to an interior loft area. The loft has its own window and will provide a good view of the garden below. The dual level nature of the building makes it a much more versatile play area, and your children or grandchildren are sure to enjoy expanding their energy climbing up and down the ladder. We were pleased to see that tongue and groove cladding had been used for the walls, as being larger than usual some manufacturers may have used a cheaper material, or cladding that’s thinner than the 12mm found here. With a strong frame as well, the building feels very strong and sturdy once assembled, so it’s even suitable for use in windy areas. The floor is made of solid sheet material, which is a more cost effective material than tongue and groove timber, but at a thicker than average 12mm it’s still more than strong enough for everyday use. We would have liked to see it raised up by floor joists, however, to give added protection against ground moisture. Wet rot is a major threat to all wooden buildings in our climate, which is why we like to see long lasting preservative treatments used by the manufacturer. Whilst a dip treatment has been used by Shire this offers a basic, short term protection and is one reason why the playhouse only comes with a one year warranty, which is the statutory minimum requirement. At this price we would have liked to see a timber building covered by at least a ten year warranty period. To give a longer lasting protection the customer will have to retreat the building themselves with a high quality wood preserver on an annual basis. We were impressed by the size of the single hinged door, and being braced it also feels reassuringly strong and sturdy. It also features a magnetic latch so that it will stay closed rather than banging in the wind if children have left it open. 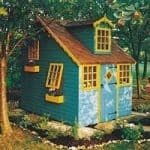 The windows are, for us, the standout feature of this playhouse. There are three of them, as well as a small glazed diamond shaped panel in the door, two at ground level and one at the elevated loft level, and two of them can be opened and closed. This allows for easy ventilation, and means that cooling fresh air can circulate on a warm day. One of the things that pleased us most about the windows is that they’re made of styrene. This is a form of plastic that looks as clear as glass, but is much tougher and is also highly shatter resistant. That’s a vital consideration, of course, for a building that young children will be playing in. Just how safe the structure as a whole is, is shown by its compliance with the EN71 standard. 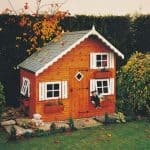 This is a European standard based around children’s toys but which is also used for playhouses. 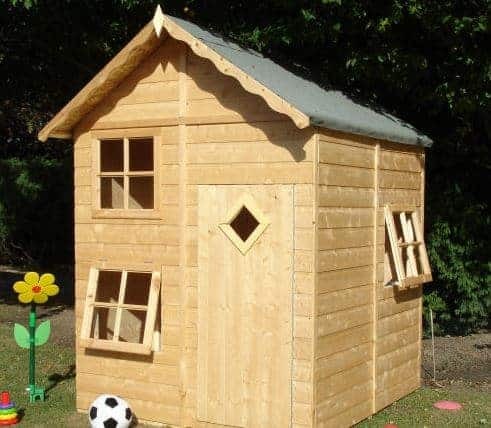 Wood preserver and paint will be needed to give this playhouse the protection from the elements it needs, and also to give it a bright and colourful appearance that will appeal to your children and grandchildren. While these will need to be sourced and bought separately, there is one extra that can be bought with the playhouse. It’s a large chess game that’s designed to be played outdoors. Children will love the big, bold pieces and it’s a great way to introduce them to this fascinating game. 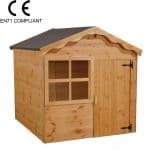 We found this to be a high quality playhouse as shown by the tongue and groove cladding, and the thicker than average roof and floor. A pressure treatment would have given a better initial level of protection, but this should still be durable as long as the customer keeps up the annual treatment process. With two levels to play on, including a spacious ground floor, this gives a lot of scope for your little ones to indulge their imagination. 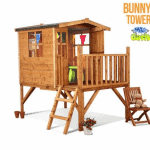 This is an easy playhouse to install, thanks to the modular design that fits together easily. You’ll still need a friend’s help, but it can be installed in less than five hours. 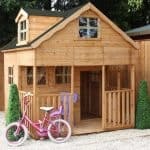 This costs considerably more than many other playhouses we’ve reviewed, and yet it is one of the cheapest two level playhouses on the UK market today. Final Thoughts: Playhouses are great fun for children aged three and above, and of course the more room they have available in them the more fun they can be. 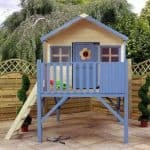 That’s why we liked the second level on this playhouse, a loft area that can be safely and easily accessed via a ladder. This can prove especially useful if you have more than one child who wants to use the playhouse at the same time. It was good to see as well that the playhouse had been designed with safety in mind, as evidenced by the styrene windows, and that it seemed tough and had good waterproof qualities.